Benji Lanyado, a travel writer for The Guardian newspaper, was one of the many travellers who were caught stranded by the closure of Europe's airspace last week. Benji was in Morocco when he heard that his flight home from Gibraltar was cancelled because of the volcanic ash cloud. Benji had no choice but to make the journey overland. He eventually arrived home on Thursday. Due partly to a mutual love of a certain football team (and because I'm also a great fan of his travel pieces) I follow Benji on Twitter. Therefore last week I followed Benji's journey home with fascination via his Tweets. Now, for The Guardian, Benji has created a Google Maps based video diary of his experiences trying to get back to London. 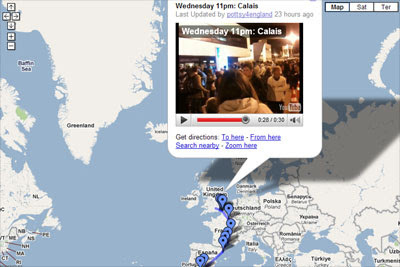 The video diary map was created partly to accompany Benji's article for The Guardian, Iceland Volcano: Where was the help?.